Jupiter normally only shows 4 of its moons to the average binoculars or telescope but at a few minutes to local midnight on 2nd May, I observed several 'moon-like' objects near to Jupiter. I took a photo through the telescope which showed 5 such objects. The 'photobomber' is actually nu librae, a 5th magnitude star. 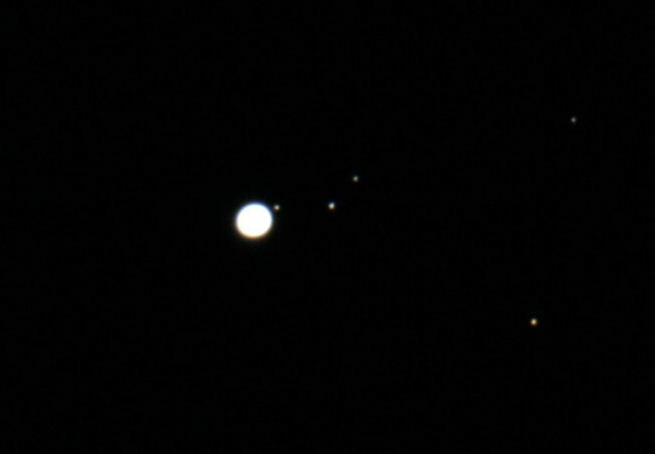 (the one on the bottom right) The others starting at the planet are Io, Ganymede, Europa and Callisto. 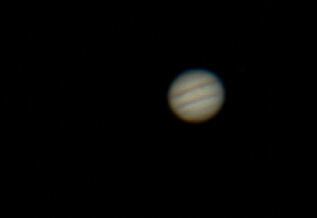 Jupiter itself was only 18 degrees above the horizon, and didn't show much detail through the murk. Re: The 5 moons of Jupiter ! !